A few weeks ago, CBS College Sports play-by-play announcer Tom Hart wrote about the importance of the spotter and statistician to a game broadcast. What this former Comcast Sports Southeast (CSS) did not say is how lucky it is to have a full support crew available when calling games. 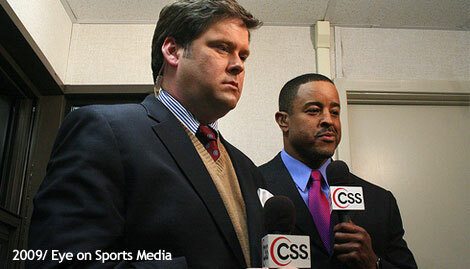 You see, CSS also covers a "high school game of the week" in the Atlanta metro area. And believe you me, there is nothing harder than doing talent stats for a high school game broadcast. I learned this the hard way this past Friday night when I was called on to fill in for Newnan County's 9-7 upset of top-ranked Grayson High School (Number 14 in USA Today Super 25 poll). Long-time Atlanta area sportscaster and national Emmy-award winning Bob Neal put it very simply in a pre-game discussion before last night's Georgia - Georgia Tech game when he said "there is nothing harder to cover as a commentator than a high school game. It is kind of backwards that most on-air announcers trying to crack into the business get assigned these games, which are much harder to broadcast than big college or pro games." So there I was at Grayson Community Stadium, working with Brandon Adams of 790theZone and former Atlanta Falcon and Atlanta Brave Brian Jordan for this Georgia high-school state championship quarterfinal game. Everything I had ever learned and/or used doing talent stats over the year was going to be thrown out the window, but I did not realize how much until after the game had started. Game between Newton County and Grason High. 2009/Eye on Sports Media. You are probably sitting there thinking I am crazy. Aren't all stats the same? You have rushes, passes, fumbles, etc. no matter what level the game is being played. But the big difference, similar to what I talked about a couple of weeks ago in regards to volleyball coverage, is the show budget and the working environment. When you work a college or professional football game, you have a much larger supporting cast. You have a real-time (or as close to real time as possible) heads-up display of the in game stats. 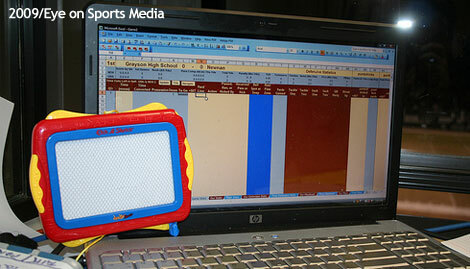 These stats give you the nitty gritty details on individual players and game stats, so instead of spending time keeping up with these details, you can work on the bigger picture, developing statistical story lines for the talent to use on air, or for the graphics pros in the truck to build the on-air presentation. If it is a major network game, the producer has probably hired two or three people to keep specialty stats, things like yards after catch, quarterback hurries, play distribution, etc. The crew may also have a statistician in the truck working with the graphics crew and in constant communication with the talent statistician and the person working official stats. Yes, official stats. The network and regional games will have a person standing right behind that crew keeping the official statistics. This person is there to verify what is being said and reported by the talent and/or graphics statistician to keep the numbers as accurate as possible. In fact, ESPN takes it a step further by having a "MIS stats" person right next to the official stats person. That person has an incredibly important role on ESPN produced games. In college football, you will notice at the top of the screen there will be an almost immediate update of a player's individual stats as the play is ending. That is because Ed Placey, ESPN's senior coordinating producer for college football, wants those numbers updated as soon as the player is getting up off of the ground. 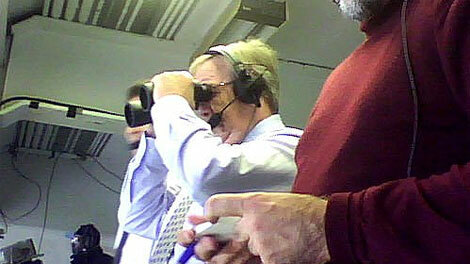 The MIS stats person is in the booth with his binoculars giving the results of the play before the home team's stats crew has decided the result of the play. One MIS stats person told me that one school told people to listen to him and not the crew because his numbers were faster and more accurate. So let's come back to a high school game. You have none of this support around you and supporting you. You have no safety net, no one to verify numbers against. There is no one in the truck tracking numbers as well. You are alone, and whatever rhythm you have used or established at the college or professional level over the years is gone, useless to you. 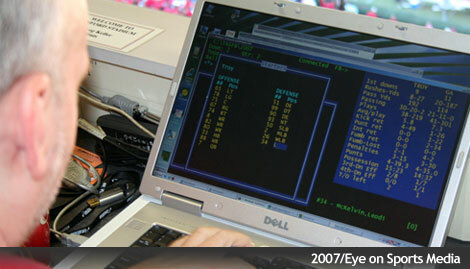 Knowing there was going to be a difference, I also had my trusty laptop with me, loaded with a trial version of StatMan. I was overly optimistic, ignoring the reality that I was depending on a "incredible and powerful" HP G-60 laptop running 64-bit Windows Vista. Doodle Pad, index cards, and a sharp pencil. 2009/Eye on Sports Media. This grand plan worked quite well for about five plays, and then the computer locked up and froze. This caused me to fall behind a couple of plays, and I was forced back to the basics: Pencil, calculator, index cards, and an Etch a Sketch Doodle Pad. At a commercial break, I bolted down two rooms in the small press box to the stats room, so that I could update numbers and get back in sync. The one man "crew" was using the same StatCrew software used by colleges, but had no idea how to use it. I asked him to bring up the individual stats, but he said "it is a DOS based program and could not be done." I knew better, but bit my tongue and left the room, resigned to the fact that I would have to wait for the 1st quarter "Quickie Stats" to get back into sync. George, who normally does the high school games for CSS had tried to give me fair warning, and I thought it could not be as hard as he was saying. And it wasn't, it was harder. I honestly think it was the hardest I have ever had to work at a game, and was so very glad I was doing stats, with a little bigger (but not ESPN level) support system, for Bob Neal and Buck Belue at last night's game at Georgia Tech. during the 2009 Georgia - Georgia Tech game as I stand by to record the results. Will I ever dare to venture into a high school game again? Well, if Clarke Central High School scores a third consecutive playoff upset next Friday, I will be at the championship game at the Georgia Dome a week or so later. Not doing stats, but taking my daughter and her friends to their first football game experience in the Dome. It will be a lot less stressful.